As Bauhinia has evolved, so has the team and one misunderstanding people have is that a Virtual Assistant (VA) is a ‘one size fits all’ solution. Speaking from experience, this is not the case. Let’s face it, none of us are all-knowing, and have endless free time in our days. 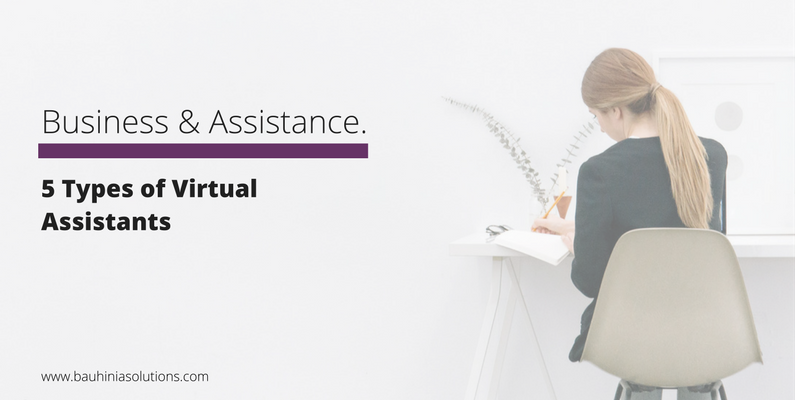 In the early days VAs were offering home-based secretarial services and as the Internet evolved, so did the skills of the Virtual Assistant. Today the term is used to describe people who utilise online tools to work virtually and through the broadening of the VA’s skills, different types of Virtual Assistants were born. 1. Administrative / Generalist – This is one of more common types of VA’s and where the term Virtual Assistant originated. These VA’s would manage your administrative and secretarial duties such as organising appointments, managing your diary, handle emails, organise travel, format documents, create PowerPoint presentations, update your expenses, send invoices, etc. This is the foundation of Bauhinia and where the business started. This is still a core service today. 2. Digital Marketing / Social Media – Digital Marketing is broad and therefore some VA’s narrow in on Social Media only. Within these roles, some VA’s will write their content and implement your strategies, while others will assist with your strategy and implement, leaving the content creation to you. Tasks can include content research, finding quotes, creating images, finding engaging questions, sending newsletters, managing Google adwords, monitoring statistics, etc. We do a bit of everything as clients have different needs, however if a client is promoting a personal brand, we recommend that they create their own content to ensure it is authentic to who they are. 3. Technical / WordPress – These Virtual Assistants are good at all the technical stuff such as setting up emails, fixing technical errors, creating backups of your website, etc. With all the online tools available today, some technical VA’s work only with WordPress, and others know their way around online marketing systems and shopping carts. These include SimplyCast, Infusionsoft, Ontraport, 1ShoppingCart, Shopify, LeadPages, OptimizePress, etc. For those focussed on WordPress, they would be able to assist with monthly maintenance and updating pages. You may find that some generalist VAs can assist with WordPress. Due to the type of clients we currently have, we are strong on WordPress with over 5 years experience creating WordPress sites. We understand what a number of the online tools can do, however haven’t had the opportunity to work with many of them. 4. Graphics / Graphic Designer – There are different levels to this type of VA – one who can create lovely images for social media and presentations, and one who has more branding depth. They use software that is specifically for design purposes. Some Graphics Designers can create simple flyers and brochures, and generally follow your existing style guide. The more experienced designers understand brand concepts and they will generally help clients to create a visual representation of themselves through colour and imagery. For any sort of branding work, we refer clients onto a Graphic Design team who would be able to better assist, however if a client needs social media images, small advertisements or simple flyers, we have a designer on the team. 5. Product Launch – These VA’s work more with online businesses who launch products or programs throughout the year. They understand the sales funnels and all the steps to a successful launch. Due to the type of clients we currently have, we’ve not been involved in the start and finish of a launch. We’ve supported clients in different aspects throughout their launch but not managed the process. Our goal is to provide our clients with an ‘all-round service’ while utilising the team’s strengths, therefore we have part-time Virtual Assistants who support our Client Managers and specialise in specific areas.